FROB, for those of you who are wondering, stands for "Fund for Orderly Bank Restructuring" and is an entitly created by the Spanish government in June last year, in order to facilitate (in particular) the restructuring of Spain's hard hit Savings Banks (Cajas). There is just one problem: as of the present time - and over seven months later - the FROB still is waiting to receive approval from the European Commission. "The essence of the FROB in fostering the reorganisation of the sector in an orderly manner and in the most financially efficient way, as well as the key role of the Bank of Spain in most of the phases of the restructuring and integration processes, are positive." says Carmen Munoz, Senior Director, Fitch's Financial Institutions group. "Fitch will assess the rating impact, if any, on a case-by-case basis with respect to financial institutions." "While the number of financial institutions that could receive support from the plan remains uncertain, Fitch believes that the orderly consolidation process reduces the risk of multi-notch downgrades for financial institutions that act as counterparties in securitizations," says Rui J. Pereira, Managing Director, Fitch's Structured Finance group. "At present, FROB will have a neutral affect on outstanding Spanish structured finance ratings and any later developments will be analyzed on a case-by case basis." The FROB came into existence, or was officially born, on 28 June 2009. At the present point in time it is not clear when it will be able to get to work. Having denied for so long that the banking system was having any major problems, it may well be that the country's banking system have missed out on the near free lunch that was offered to everyone else (Monsieur Trichet recently said there would be no second opportunity for the banks), and so the first tentative efforts to clean up the mess are now hitting straight up against the EUs unfair competition regulations. Initially furbished with 9 billion euros in capital, the Fund was also empowered to issue up to 27 billion euros in third party debt during the remainder of 2009, and a further quanity from 1 January 2010, up to a grand total of 90 billion euros. Fitch actually assigned a AAA rating to FROB's first bond issue, on the basis of the fact that it was backed by the Kingdom of Spain, which also currently enjoys an AAA rating (from Fitch at least, if no longer from Standard and Poor's). As Fitch point out, "the 'AAA' rating reflects the explicit, irrevocable and unconditional guarantee provided by the Kingdom of Spain, the Bank of Spain will act as paying agent, under a Spanish Treasury arrangement, and bond issues are zero risk weighted and ECB repo-eligible". (well, you can read a bit more about Fitch's assessment of FROB here). The key point to notice about FROB is, I feel, that while debt issued is guaranteed by the government, it does not form part of gross Spanish government debt for Eurostat audit purposes. You could call its debt, if you want, a form off-balance-sheet debt, and the FROB could be thought of as some kind of Spanish Sovereign SIV. Indeed, the condition that the bonds are repo-eligible suggests that the Spanish banks can simply earn carry from the spread by taking them over to the ECB as collateral for loans. 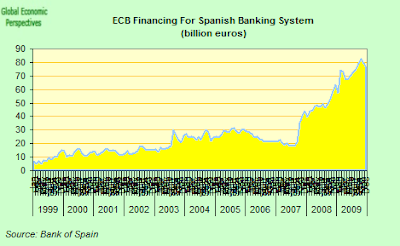 As we know, Spain's banks have been making considerable us of ECB funding in recent months - although it is not clear what happens as the ECB longer term enhanced liquidity programme is wound down. "In line with the 19 October 2009 preliminary view of Eurostat, the bonds (around 30% of GDP) expected to be issued by the Special Purpose Vehicle associated to the NAMA to finance the purchase of loan books from certain financial institutions are not recorded as government debt, while the majority of those bonds are guaranteed by the Irish State." So clearly, financing the removal of toxic assets from Spain's banks and cajas in this way has one big advantage - it doesn't add to sovereign debt on a one for one basis - but it has the peculiar disadvantage that no one really knows what happens if the people receiving the aid cannot pay up eventually. That is, if the issue to hand is a solvency and not a liquidity one. Well, it is known what would happen in the sense that Spain's government would have to assume its responsibilities, but the unwinding would evidently be messy. So what is the delay? Well basically, when this whole structure was set up the Bank of Spain didn't seem to be fully aware that the EU Competition rules put a limit on direct aid to banks and cajas at 2 percent of their risk capital. Aid above this level would violate the EU unfair competition regulations. The FROB is mainly directed at Spain's Cajas, since the 45 largely unlisted savings banks have been hit badly by the slump in the country's property sector after a decade-long boom and have some of the highest non-performing loan ratios in the financial sector. Now it appears that the needs of the first three Caixas (the Catalan version of Caja) seeking to restructure under the FROB (Manresa, Tarragona and Catalunya) may well go beyond the 1.315 billion euros currently available under the regulations. And they may therefore need additional aid from the Spanish government under another heading. And it is just how to go about effecting this support that seems to be the sticking point in the negotiations - negotiations which have now dragged out over several months, depsite the fact that the situation needs somewhat urgent resolution. Help does however now seem to be at hand. The three savings banks in question agreed last week to postpone plans to merge until the European Union's executive Commission had ratified the FROB restructuring plan, and the European Commission said on Monday it was confident of issuing a positive decision on Spanish government scheme. The Commission, which has the responsibility for ensuring that state aid does not skew competition across the 27-country EU, is in "constructive discussions" with the Spanish authorities over the plan, according to Commission spokesman Jonathan Todd. And just in case the discussions need that little bit extra gusto, the Spanish Economy Commission Joaquin Almunia will shortly be taking over as Competition Commissioner in the forthcoming reshufle. According to Jonathan Todd "The Spanish authorities have to clarify what their intentions are". Honourable I hope!. Todd also stated that while there was no fundamental problem, the Commission had to ensure that the scheme complied with EU state aid rules. In particular the sticking points seem to revolve around the interest rate the Cajas will have to pay to the FROB, and whether or not any additional bailouts from the Spanish government will need to go to Brussels on a case by case basis. Whoever was it who said, sometimes trying to make things easy you end up making them more difficult. "The Commission is confident that we will be able to come to a positive outcome on the regime." Moving on to other matters, a great deal of attention has been showered of late on the perceived weaknesses of the Greek statistical agency. But Greece is far from being the only example of a European country were the process of statistics gathering is rather unsatisfactory. Enrico Giovannini, chairman of the Italy’s national statistics institute, also recently argued that national statistic agencies should have the same autonomy as central banks to avoid attempts by government to influence economic data. Well, Spanish Property Insight blogger Mark Stucklin just drew attention to another example of a practice which is far from perfect - the Spanish housing ministry's property prices statistics. Mark draws our attention to the fact that the Economist, in their latest house affordability survey, find that Spanish house prices are "still 55% above their fair value despite Spain’s property market crash". Indeed using its "fair-value measure" methodology for property "based on the ratio of house prices to rents" the Economist find that Spain's property is the most overvalued among the countries surveyed -overvalued by 55%, followed by Hong Kong (+53%), Australia (+50%), France (+40%), Sweden (+35%), Ireland (+30%), and Britain (+29%). The problem with this method is it’s based on official housing market price statistics, which in Spain’s case are detached from reality. As I explain in my last article Spanish property prices down just 6pc in 2009 says Government, everyone in Spain knows that the Ministry of Housing’s figures are baloney. There are no reliable figures for the Spanish property market, but I guess that prices are probably down by more than 10% on average last year, and by 30% or more since the peak. If The Economist used real transaction price figures it would find that Spanish housing prices are much closer to fair value than they think. Given how damaging it is for Spain to have international creditors read in a prestigious magazine like The Economist that Spanish property prices are the most overvalued in the world, you would think the Ministry of Housing would be racing to make its figures more accurate. That one step alone would do more good than all the ineffective initiatives produced by the Ministry of Housing in the last decade. You would think Spain's Housing Ministry would eventually recognise this, wouldn't you? We live in hope. In the meantime EU Finance ministers agreed this week to seek powers for the EU’s statistics division to audit official financial information from member states. An earlier - 2005 - Commission proposal would have given just this “audit capacity” to Eurostat, but it was rejected by the EU governments. The failure to take this decision then is something which is bitterly regreted by many of those involved. Spanish economy minister Elena Salgado, who chaired the Finance Ministers meeting, in subsequent questions with journalists dismissed a suggestion that Greece would default on its debt. “I think Greece is going to do all that is necessary so we’re not worried about that,” she reportedly told journalists. I only wish I could bring myself to think that M. Salgado was going to do all that was necessary to bring down Spain's deficit by taking the economy back to job creation and growth. Unlike her, I am worried about that, and remain unconvinced by all her statements to the contrary.